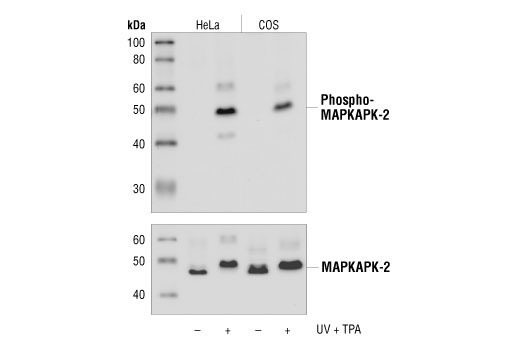 Phospho-MAPKAPK-2 (Thr334) (27B7) Rabbit mAb detects endogenous levels of MAPKAPK-2 protein only when phosphorylated at threonine 334. Monoclonal antibody is produced by immunizing animals with a synthetic phosphopeptide corresponding to residues surrounding Thr334 of human MAPKAPK-2. In response to cytokines, stress, and chemotactic factors, MAP kinase-activated protein kinase 2 (MAPKAPK-2) is rapidly phosphorylated and activated. It has been shown that MAPKAPK-2 is a direct target of p38 MAPK (1). Multiple residues of MAPKAPK-2 are phosphorylated in vivo in response to stress. However, only four residues (Thr25, Thr222, Ser272, and Thr334) are phosphorylated by p38 MAPK in an in vitro kinase assay (2). Phosphorylation at Thr222, Ser272, and Thr334 appears to be essential for the activity of MAPKAPK-2 (2). Thr25 is phosphorylated by p42 MAPK in vitro, but is not required for the activation of MAPKAPK-2 (2). Ben-Levy, R. et al. (1995) EMBO J. 14, 5920-5930.